Anyone close to establishing roots in Singapore as a permanent resident should make it a point to pay attention to our beautiful little island at dusk at least once. Not only does our city truly come alive at night, but few sights here are quite as spectacular as views of the local sunset. Make an appointment for some self-reflection at around 6.50pm as you revel in the contrasting colours of the evening sky, with the sun disappearing into the distant horizon. Or if you prefer, bring your loved ones along as well! Some places in Singapore equally showcase both the sunset and sunrise in all their glory — the Changi Boardwalk is one of them. Tucked away in the east end of the island, Changi Boardwalk extends for as long as 2 kilometres and culminates in a section that is aptly known as Sunset Walk. In spite of its relative distance from the city centre, Changi Boardwalk is easy enough to find: simply look out for the Changi Point Ferry Terminal. The surrounding Changi area also comes with no shortage of good food, so your dinner plans afterwards should be set! Located in the city centre, Marina Barrage doubles as a reservoir as well as a perfect vantage point of the city skyline, offering visitors 360° views of the famous Marina Bay. 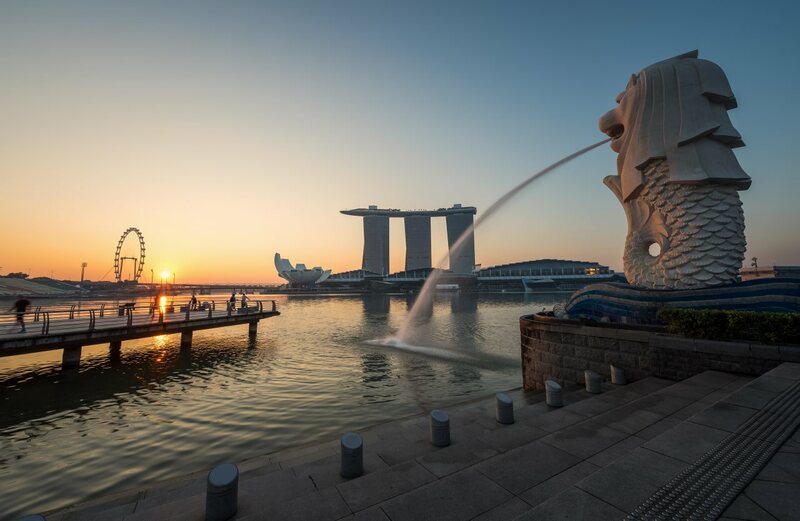 One of the best ways to appreciate the sights of the area is to take about half an hour to walk from Clarke Quay to Marina Bay, where you will be greeted by the sunset at around 7pm. The Barrage has a completely verdant roof that is perfect for a picnic, so you may wish to bring along some refreshments for the journey. Watch the iconic landmarks of the city come alive against the backdrop of the setting sun, all from the comfort of your picnic mat. Thinking of a place that is a little less touristy? Look no further than the lalang field at Tuas. A hugely popular wedding photography site, this open secret is situated alongside Tuas South Boulevard, in the extreme west of the island. Its relative obscurity does mean that you need to hail a cab to get to this place but the journey is truly well worth the fare. This lalang field offers you an unparalleled, utterly unobstructed view of the skyline as the sun plunges downwards at the end of the day. Bring along your camera to really make the best of your time there! Labrador Nature Reserve is a particularly idyllic section of Southern Ridges that offers those in the city centre a quick, brief getaway from the rest of the world. Unlike the lalang field in Tuas, though, this one is easy enough to get to via public transportation. Simply alight at Labrador MRT station and begin your short trek to the beach. Try getting there a little earlier and follow the trails put in place by the National Parks Board, where you can soak in the pleasant natural ambience. As the sky begins to darken at dusk, walk along the beach area and watch as the sun sets into the sea. Also situated within Southern Ridges, the ever-undulating Henderson Waves offers yet another perfect option for sunset viewing in the area, apart from Labrador Nature Reserve. Wonder at the melding of a multitude of hues in the sky as you walk down the length of Henderson Waves. The bridge is busier on the weekends so if you prefer taking in the views in relative solitude, get there on a weekday evening instead. Be sure to wear a more comfortable pair of shoes as well! Need a place for your evening run? There are few better places in the north of Singapore for that than the historic Upper Seletar Reservoir Park. Imagine beginning your hour-long jog there at around 6pm, and ending it with a beautiful sunset in the background. Upper Seletar Reservoir Park offers a well-maintained, clearly demarcated pathway for joggers, making the place truly ideal for such a purpose. You can often see the stars at night from here as well! Like Changi Boardwalk, Punggol Waterway Park is yet another place in Singapore that offers gorgeous views of both the sunrise and sunset. The park is sectioned into four different areas, and out of these four, Jewel Bridge is by far the best spot for sunset viewing. You can easily get to Punggol Waterway Park by either MRT or bus, whichever is more convenient for you! Punggol is also a great place to live in; if you are still looking for a permanent home here, definitely look into the homes that are available in the area.